We prepare our sauces, dips, dressings, marinades, cookies, muffins and loaves in The Real Food Kitchen. Yeah, you could call us control freaks… we won’t be offended. What we won’t do is outsource our control of ingredients or nutritional goals to some big food company just to get cheaper prices. RFRK’s menus are always developed with healthy bodies and delicious taste in mind. We start by analyzing all ingredients to avoid nutrient-void fillers and artificial colours, flavours, and sweeteners. Even our everyday pantry is one to brag about with basics like sea salt, nutritional yeast, dehydrated carrots and maple syrup. Once we’ve stacked our ingredient deck, we develop recipes with a goal of reducing total salt, sugar and saturated fat content per meal. By cooking in our own kitchen, we are in control of our recipes as well as the cooking methods used! 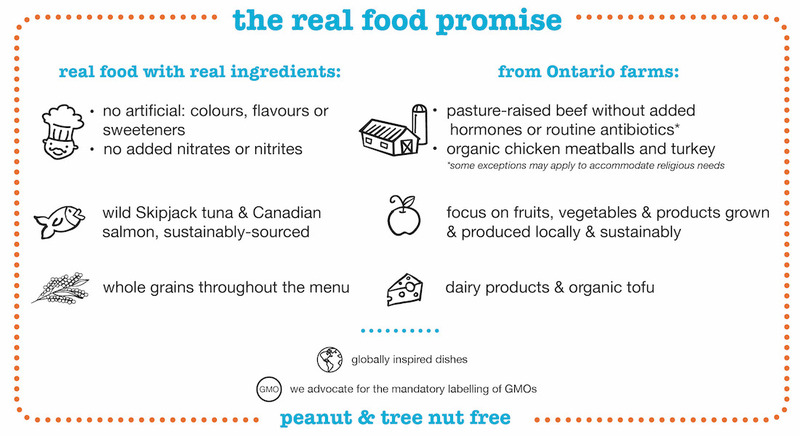 Did you know that in 2016, 52% of dollars spent on food served by Real Food for Real Kids was sourced from local and/or organic suppliers? Click here to check out the Real Food Menu! We’re proud to create a menu that celebrates cultural diversity. As adults, we remind ourselves that culturally adventurous foods are enjoyed by kids everyday around the world (without protest). To us, serving a multicultural menu is about setting kids up to develop a taste for different foods and flavours, while being mindful to balance both the familiar and the new. Our menu includes recipes from North America, Latin America & the Caribbean, Africa, Europe, South Asia, and Southeast Asia. Kids plates will also include dishes from India, Greece, and Italy! We don’t just break bread together …we break pita, focaccia and tortilla!